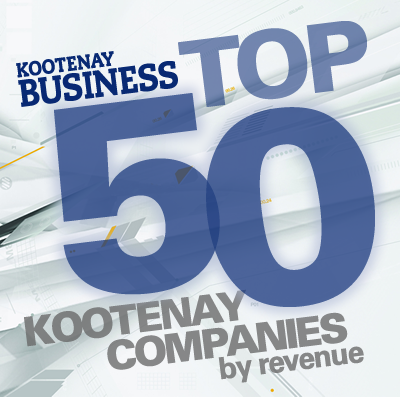 It’s that time again for Kootenay Business to present our list of Top 50 Kootenay companies by revenue. This year, we welcome two new companies to the list—Acklands-Grainger Inc. and CanWel Building Materials Group Ltd.
Acklands-Grainger has a long history, having been founded as Acklands in 1889 by Dudley Ackland. In 1996, Acklands was purchased by publicly traded company Grainger, and the name was changed to Acklands-Grainger Inc. The company takes pride in being Canada’s largest distributor of industrial, safety and fastener products. In the Kootenays, Acklands-Grainger has a presence in Cranbrook, Sparwood and Trail. CanWel, founded in 1989, is Canada’s only fully integrated national distributor of building materials, lumber and renovation products. CanWel, which purchased Jemi-Fibre operations in the Kootenays in 2016, also operates a vertically integrated forest products company through its CanWel Fibre division based in Western Canada.